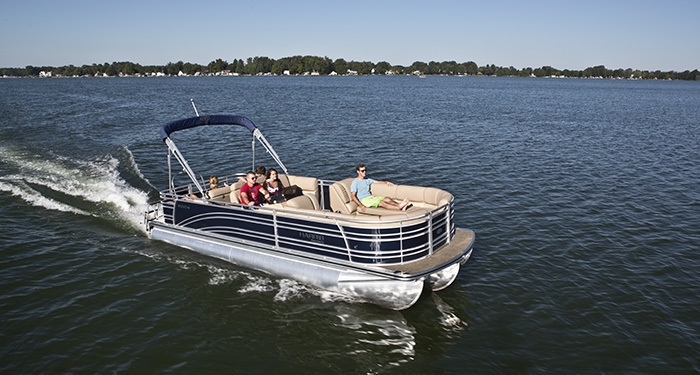 Boats.com reviewed this top of the line pontoon boat and found handling to compare with a V-hull. It’s hard to beat an afternoon spent lounging on the back of your favorite boat. I’ve got my iPod ready to plug into the stereo system, fresh drinks at hand. The surprise? 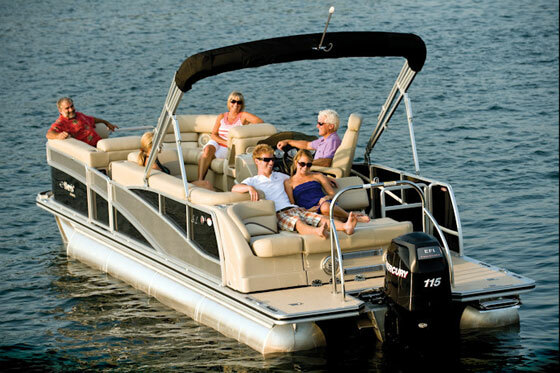 This setting isn’t the back of your favorite express cruiser…this is actually a pontoon boat, the Grand Mariner SL 250 by Harris FloteBote. More and more, manufacturers are blurring the lines between pontoons and the conventional fiberglass market. 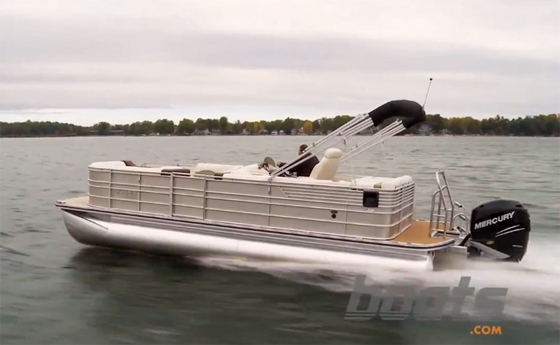 Pontoons aren’t just mimicking v-hulls in terms of amenities, they’re also stealing some of their performance thunder. 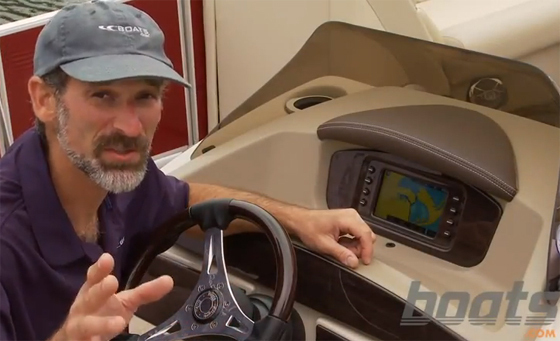 Crank the wheel at speed and this Grand Mariner banks into a turn much like a V-hull. What deserves the credit? Harris calls it the XTR performance package. Conventional wisdom would have been to cover this area in one big sunpad. Jane, why the change of thought here? Jane: Well that is how traditional pontoon boats were designed. The large sunpad was there to cover up the large engine and muffle the noise from the occupants of the boat. But what changed is engine technology. Now we have four stroke engines; they run quiet. And instead of taking up all that space with a sunpad, now we can give it to people in seating. And what we did here is we increased seating and we made it more open. 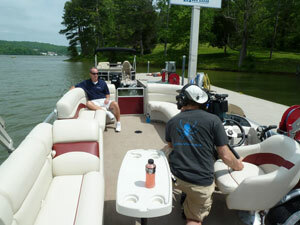 So people can talk to the driver from back here and really enjoy the social aspect of boating. Now Jane, this has gotta be one of the more interesting pontoon configurations I’ve seen out of the water. Tell me, what exactly are we looking at here? Jane: Well what we did is we tried to take the characteristics of a fiberglass hull and mold that into our third pontoon. So you can see on our center pontoon we’ve actually started to give it some of the characteristics of a fiberglass hull. We also made sure and lowered that center tube a full two inches so that it would start to cut through the water, so you’re really getting that true V hull performance. Also we gave it a full aluminum skin to reduce the resistance against the water, and added lifting strakes on the two outside tubes. Extreme performance requires extreme construction methods. Fortunately, that’s a Harris trademark. Below the deck, our test boat featured cross members run 16” on center. That adds strength to the frame. Further strength is provided by the M bracket that attaches tubes to the cross members. Rather than segmented, it’s one solid piece of aluminum on both sides. Fasteners are a step beyond the norm. Harris’ “tech” screws are put in with enough force that they’re almost friction welded. During our performance testing, the Grand Mariner accelerated hard enough out of the hole to pull a skier or wakeboarder, and with a 225 hp Mercury Verado outboard, we reached a top speed of 38 mph. I found those same performance hull characteristics also meant I had to be quick on the trim. Cornering demands the engine to be planted low in the water, while more running angle is required to reach top speed. Beyond performance, there are a number of features Harris does extremely well. Take this deep ski locker. Like the fuel tank and motor pod, it’s integrated into the center tube, taking advantage of every inch of available space. Aft, a beefy tow bar offers a secure attachment point for skiers and boarders. Rotomolded seat bases provide storage throughout, in every nook and cranny. And on a pontoon, you can’t forget cupholders. I think we counted over 20 on this boat. They’re even lighted so they’ll glow at night. Obviously this a premium model, and as such it comes at a premium price tag. 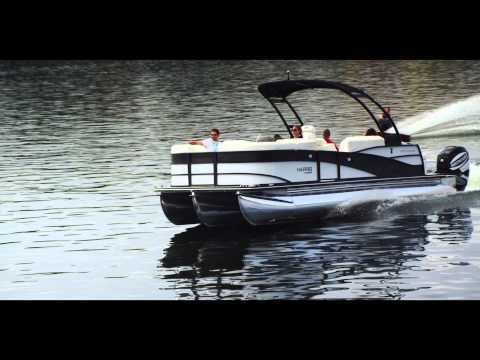 But if you’re in the market for a top-of-the-line pontoon that just may rival your neighbor’s V-hull, you’ll want to put the Grand Mariner SL 250 on your short list. For more information, visit Harris FloteBote.